The HiLife brand of dog and cat foods is owned by family-run Town & Country Petfoods, based in Melton Mowbray, Leicestershire. HiLife is one of the UK’s most popular petfood ranges and was established in 1974, although it seems to have achieved this without a lot of high-profile advertising, so they must be doing something right. 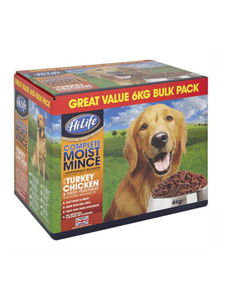 HILife produce a range of moist and semi-moist foods. 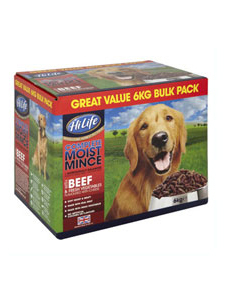 One thing HiLife have is a moist mince food which is very useful if you have a dog which is struggling with dried kibble or has teeth problems. Ingredient-wise it's maybe not up there with the best of the bunch if you're looking for high digestibility (you'll be picking up more poo than you would by feeding a high quality natural food) but it's a lot better than some of the highly advertised brands which conceal economy ingredients, so if a semi-moist food is a compromise that suits your dog then maybe this is the one for you. This is not a premium natural food, it is a basic recipe based upon meat meal, soya and wheat, so may not suit dogs with some sensitivities to ingredients. However, the amount of meat included does seem higher than some basic foods. Meat Meals (including Beef min.20%), Ground Whole Wheat, Soybean Meal (produced from genetically modified soya), Sugar, Wheat Bran, Poultry Fat, Salt, Vegetable Oil, Poultry Stock, Minerals, Cheese Powder (min. 0.5%). Nutritional Additives: Vitamin A 10,000 IU/kg, Vitamin D3 1500 IU/kg, Vitamin E 150mg/kg, Copper Sulphate Pentahydrate 35mg/kg, Zinc Oxide 89mg/kg, Calcium Iodate Monohydrate 1.4mg/kg, Antioxidants. Meat Meals (including turkey & chicken in variable proportions, min.20%, bacon min.0.5%), Ground Whole Wheat, Soybean Meal (produced from genetically modified soya), Sugar, Wheat Bran, Poultry Fat, Salt, Vegetable Oil, Poultry Stock, Minerals, Bacon Flavour. Nutritional Additives: Vitamin A 10,000IU/kg, Vitamin D3 1500IU/kg, Vitamin E 150mg/kg, Copper Sulphate Pentahydrate 35mg/kg, Zinc Oxide 89mg/kg, Calcium Iodate Monohydrate 1.4mg/kg, Antioxidants.